This was my third time making hummus. The first time I used canned chick peas/garbanzo beans. The second time I used freshly cooked chick peas and made two different kinds: regular and jalapeño. This time I cooked the beans yesterday and used tahini along with the other ingredients. I only had half a lemon so I had to use ReaLime juice to get the tang I wanted. I didn't measure any of the ingredients, but I'd guess about 1 1/2 cups beans, 1 Tablespoon of tahini, 1 Tablespoon of lemon/lime juice plus some lemon zest, 2 large garlic cloves and 1/4 teaspoon salt. I stopped my food processor a few times and taste-tested the spread until it was the right flavor and consistency. 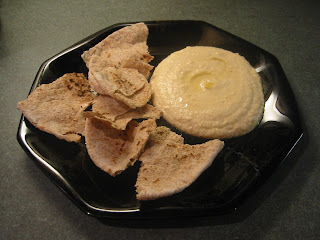 I drizzled some olive oil and a little lemon zest over the hummus before serving with some lightly toasted whole wheat pitas.